Pain Physicians NY (Brooklyn, Queens, Manhattan, Bronx NYC) is one of the first Pain Management Clinics in New York to offer Platelet Rich Plasma (PRP) Injections for patients suffering with Knee Pain. We provide effective Posterior Cruciate Ligament (PCL) injury treatment including advanced rehabilitation therapy and surgery if required. Our facility equipped with the most advanced, cutting edge equipment to treat pain. 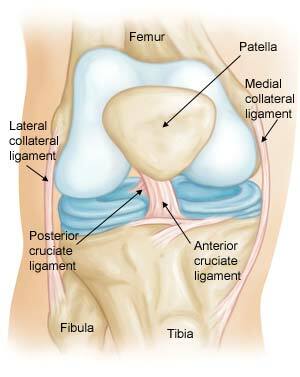 The posterior cruciate ligament (PCL) is a band of ligaments running at the back of the knee connecting the shinbone to the thighbone. It provides support to the knee joint while at the same time it keeps the tibia from moving too far back and away from the joint. Compared to the anterior cruciate ligament (ACL), it is stronger and less prone to injuries. What Are the Causes of PLC injury? Injuries to the back of the knee are not very common, and so are Posterior Cruciate Ligament (PCL) injuries. Certain impacts that happen while the knee is bent, though, may be the cause of Posterior Cruciate Ligament (PCL) injuries. These can happen during a car accident when the knee hits the dashboard or when an athlete falls on a bent knee. Despite being quite strong, the ligament can be weakened by various reasons, causing even a simple misstep to create a Posterior Cruciate Ligament (PCL) injury. When these happen, it causes the ligament to be stretched abnormally leading to a sprain, while extreme impact can cause the ligament to be torn. Diagnosis is primarily done by observation, whereby the doctor or health specialist looks for the symptoms listed above. To establish the extent of the damage to the ligament, various physical tests can be performed by the doctor such as the Lachman tests, pivot shift tests and posterior drawer tests. These injuries are rarely fatal or even serious, but depending on the extent of the damage it can lead to extreme complications. For example, an unattended Posterior Cruciate Ligament (PCL) tear can lead to osteoarthritis in the knee, further affecting other parts of the knee. To prevent such complications, X-ray and MRI scans may be requested to establish the extent of damage to other areas. Primary treatment involves managing the swelling and pain in the knee. This can be done through medication or home remedies to control the symptoms of basic Posterior Cruciate Ligament (PCL) injuries. Over-the-counter medications like ibuprofen help to reduce pain and inflammation around the knee. Ice compressions and a knee brace can help reduce the inflammation. In more serious cases, corticosteroids may be applied either orally or by injection into the infected joint. If the ligament is completely torn, though, surgery may be used to remove or repair it. The most advanced pain management center, Brooklyn pain management doctors and specialists at Pain Physicians NY offer unique, individualized approach to manage your Posterior Cruciate Ligament (PCL), knee pain injury. We are using the most effective pain management options including Platelet Rich Plasma (PRP) and Corticosteroid Injections and utilizing the latest technologies available in USA.